Jus Cuz, under jockey Luis Yescas, Jr., defeating stablemate Babe Watchin in the $16,007 ARA Futurity on Sunday at Turf Paradise. PHOENIX, AZ—OCTOBER 28, 2018—Jus Cuz won the first stakes race of the day at Turf Paradise in the $16,007 AQRA Futurity on Sunday afternoon; the stakes victory was also the first career win for the Texas Icon filly. Luis Yescas, Jr piloted the filly to a one-length victory in the 350-yard race, finishing in 17.772 to earn a 93 speed index. Jus Cuz ($9.20) is trained by Matt Fales for owners Osvaldo Venegas and David Guzman. She was bred in Arizona by Elaine Cota Robles, out of the First Down Dash mare Cuz I Say So. This was the first win for Jus Cuz, who had made five previous starts and had finished second three times. It was her second stakes appearance; in April, she qualified for the $55,000 Desert Classic Futurity. Babe Watchin and Mark Jasso led the rest of the pack for a second-place finish. Babe Watchin is a 2-year-old gelding by Texas Icon, out of the Takin On the Cash mare Watchin the Rain. He was bred by Matt Fales, who also trains, and is owned by Ralph and Carolyn Fales. 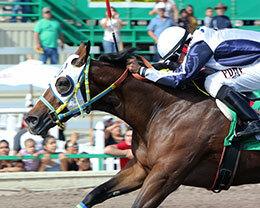 Babe Watchin made his most recent start at Los Alamitos in the $15,000 The Plan Handicap, and he was third in the $31,000 Spring Fling Futurity at Turf Paradise in April. Post-time favorite Redneck Woman, breaking the from the inside, came out at the start was in second place early. The Texas Icon filly dueled with Babe Watchin before finishing third. 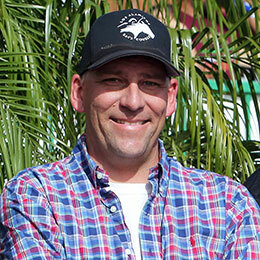 Trainer Matthew Fales saddled the trifecta in Sunday's $16,007 AQRA Futurity at Turf Paradise. Redneck Woman was ridden by Jorge Bourdieu and completed the trifecta for trainer Matt Fales. Ralph and Carolyn Fales own and bred the 2-year-old filly in Arizona, out of Secret Return, by Canth. Redneck Woman, still a maiden in four lifetime starts, finished third in her most recent start at Los Alamitos, and had trouble at the gate. She debuted at Turf Paradise and was second in the Desert Classic Futurity in April. Texas Icon, a Top 10 Leading third-crop sire of money earners in 2018, who sired the top three finishers in the AQRA Futurity, stands at Ralph and Carolyn Fales' Fales Ranch near Coolidge, Arizona. Completing the field were Nochebonita and Rv Pete. Baby Macarena was scratched.